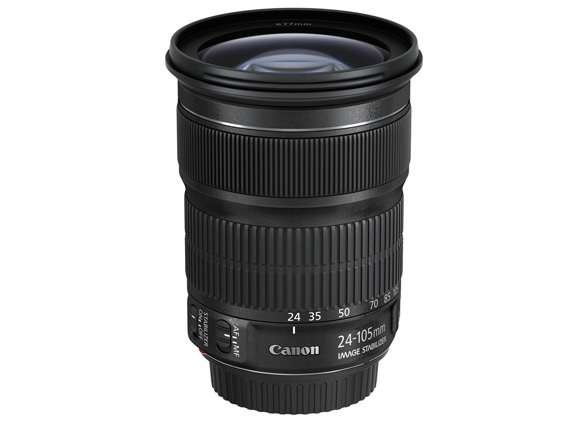 Sitting in a cheaper price bracket compared to pro L-series lenses, the Canon EF 24-105mm f/3.5–5.6 IS STM standard zoom has a more EF-S feel to the look and design. Designed for Canon full-frame DSLRs such as the 5D Mark III or 6D, the Canon EF 24-105mm f/3.5-5.6 IS STM(24-105mm STM) offers a versatile wide-angle through to short telephoto focal length in a single optic. The new lens is also compatible with Canon APS-C DSLRs, such as the 7D Mark II, on which it offers an equivalent 38.4-168mm focal length, taking into account the 1.6x crop factor of the smaller sensor. A 38.4-168mm range is much less versatile than the intended 24-105mm, however, and dedicated EF-S lenses such as the $299 EF-S 17-85mm f/4-5.6 IS USM, with its equivalent 27-136mm focal length, is a more usable option for APS-C shooters. To keep the price down, the new EF 24-105mm STM features a variable maximum aperture of f/3.5 at 24mm, closing down to f/5.6 at 105mm, meaning that it lets in over a stop less light at the longest focal length. How important this is depends on your photography, but if you’re regularly shooting in poor light, or want faster shutter speeds, or like to throw backgrounds out of focus, wider apertures rock! The 24-105mm STM’s IS can help with shutter speeds and Canon claims it offers up to four stops, making it possible to get shots free of camera shake with shutter speeds as slow as 1/8th second when fully zoomed. IS is only a real benefit on a standard zoom if you’re shooting relatively static subjects, however, and if you’re intending to shoot action, then faster apertures that let in more light, such as f/4 or f/2.8, are desirable. You can’t get these “fast” fixed apertures on an EF zoom in this price bracket, however, so the 24-105mm STM offers a good compromise between features and affordability for the market it’s aimed at. It’s also the first EF lens fitted with Canon’s STM autofocus motor that’s designed to give smoother and noise-free performance for video capture, which should catch the attention of budding videographers starting to shoot full-frame. In terms of the lens design, there’s a large rubberized zoom ring at the rear, a decent focus ring towards the front, a 77mm filter thread, an AF/M switch with full-time manual focus override, and an on/off IS switch. 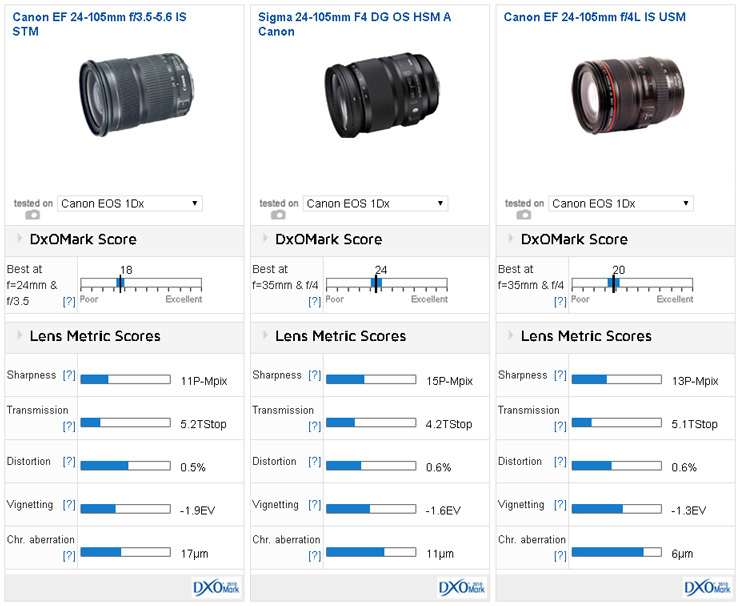 With Overall DxOMark Scores for the 24-105mm STM ranging from a high of 18 tested on the on EOS 1Dx, to a low of 10 on such full-frame DSLRs as the EOS 1D Mark II, or a mere 8 on such APS-C cameras as the EOS 350D, the results are in the lower half of the performance spectrum. This isn’t unexpected for a zoom lens covering a wide-angle to telephoto focal range, however, which is optically fairly challenging to achieve. The good news is the 24-105mm STM manages to achieve its top score of 18 mounted on semi-pro full-frame models such as the 5D Mark III and 6D — in other words, the type of full-frame camera on which the lens is likely to be used. In terms of the 24-105mm STM’s overall Sharpness and Transmission performance, its results of 11P-Mpix and 5.2 T-stop, respectively, again rank in the lower half of the spectrum, but its metrics fare a little better for Distortion, Vignetting and Chromatic Aberration. 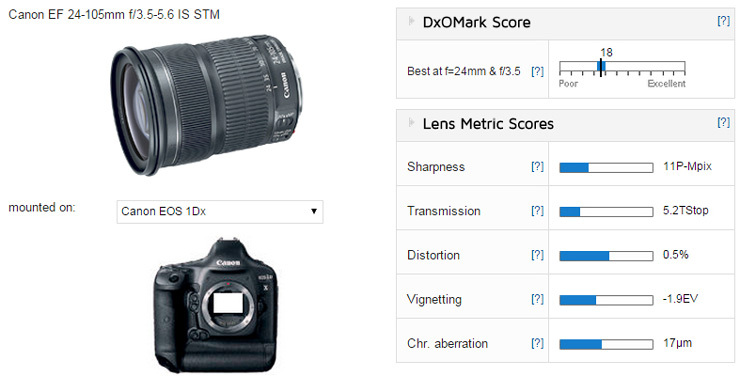 The Canon 24-105mm STM achieves its best overall DxOMark Score of 18 on the EOS 1Dx, 5D Mk III, and 6D, with scores when mounted on the 5D Mk II and 1Ds Mark III not far behind. The 24-105mm STM’s strongest performance overall is at 24mm f/3.5. For center sharpness, the lens resolves the greatest detail at focal lengths of 24 to 85mm using wider aperture settings between f/3.5 – f/8. With the lens aperture closed down between f/11 – f/36, however, center sharpness starts to drop off, meaning that the 24-105mm STM isn’t an ideal optic for photographers wanting long depth of field. Despite its best center sharpness at the wider aperture settings, when it comes to edge sharpness, the 24-105mm STM doesn’t offer homogenous sharpness at any focal lengths — not even between f/3.5 – f/5.6. 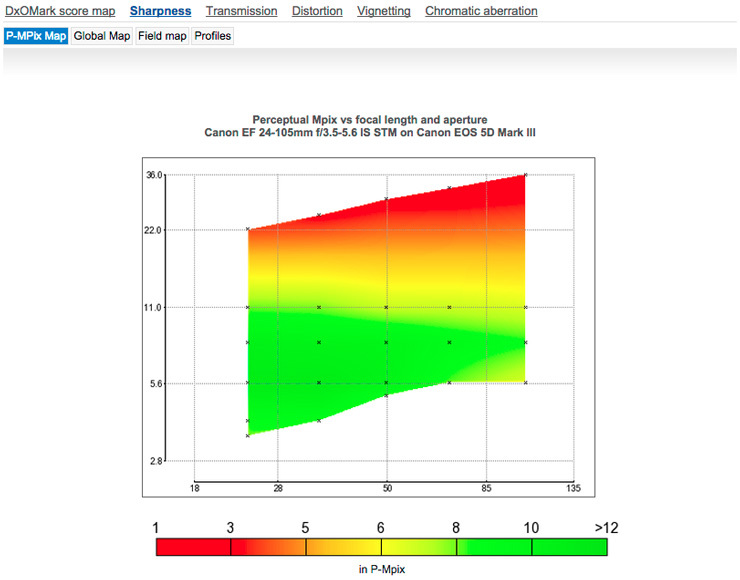 So although results are sharp in the center, the edges start to drop off at wider apertures. Between f/8 – f/22, results are more homogenous across the frame, but overall sharpness falls into the yellow zone from around f/11, meaning that the 24-105mm STM really delivers good levels of homogenous sharpness only at an aperture of f/8. 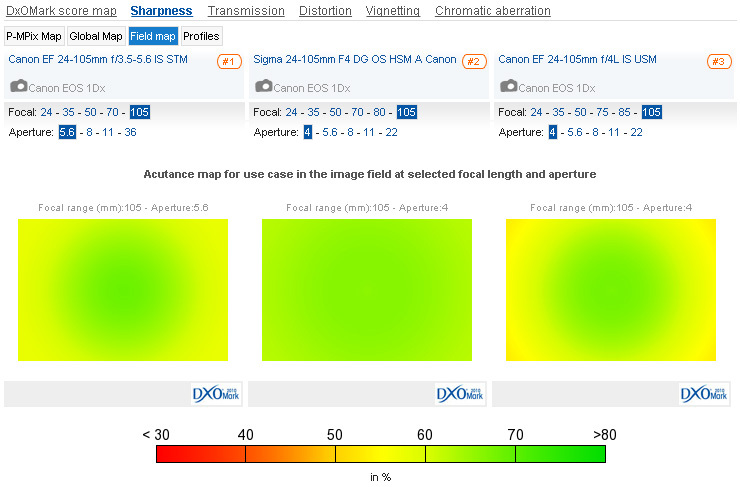 The Canon 24-105mm STM overall Sharpness P-Mpix map shows that results are strongest between 24mm – 85mm at wider apertures (from f/3.5 to f/8). 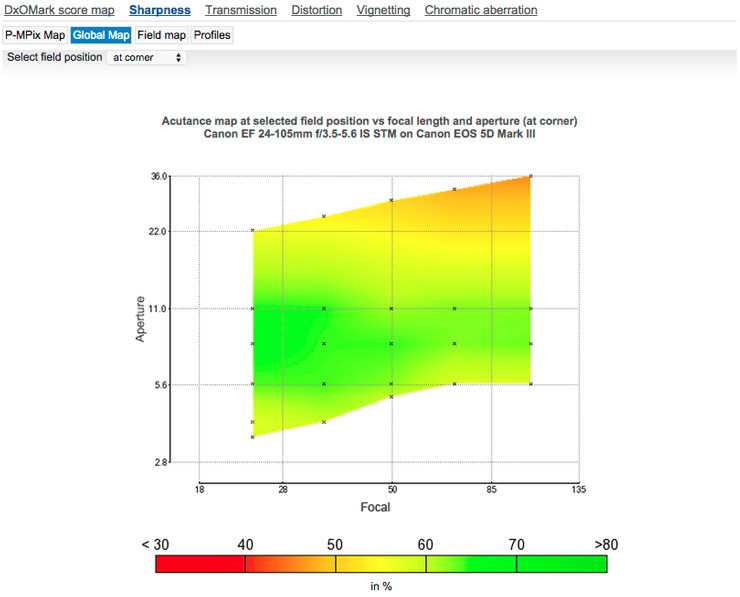 Analysis of edge sharpness, however, indicates that the 24-105mm STM really offers homogenous sharpness only at f/8, with edges dropping off at the wider lens apertures. Up against the more expensive competition in the shape of the $899 Sigma 24-105mm f/4 DG OS HSM A, or Canon’s own $1,149 EF 24-105mm f/4L IS USM lens, the 24-105mm STM drops into third place on the podium. With scores of 18 for the STM version and 20 for the more expensive f/4L lens, however, there isn’t a huge difference between the two Canon options. 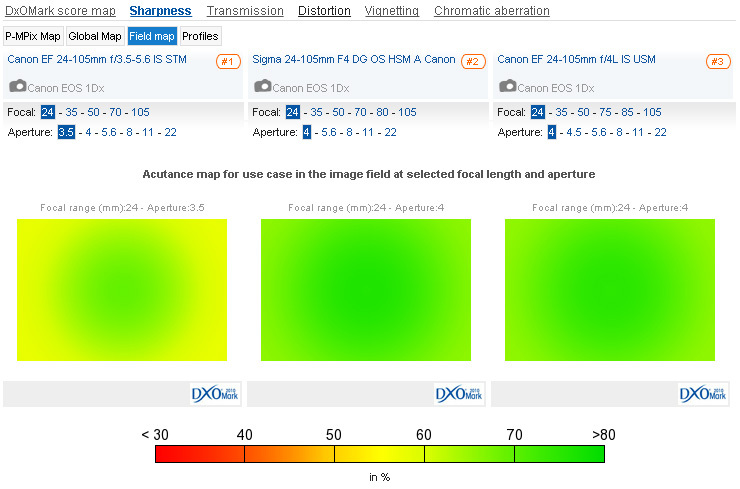 With similar results for their Transmission, Distortion and Vignetting Lens metrics, the Canon f/4L boasts an advantage for Sharpness, with 13P-Mpix compared to 11P-Mpix for the STM model, and offers notably less fringing, too. In terms of sharpness across the frame, the Canon f/4L version offers reasonably homogenous results at all aperture settings between 24mm – 50mm, but zoomed in between 50–105mm at wider aperture settings, the corners tend to drop off, but it’s still sharp in the center. That’s something of an advantage compared to the 24-105mm STM, which as discussed excels for sharpness only at f/8. Tested on the EOS 5D Mark III, the Sigma 24-105mm offers homogenous sharpness at all focal lengths and aperture settings. True, sharpness isn’t quite as strong at the minimum aperture settings of f/16 and f/22, dropping into the yellow zone, but results are still homogenous. So for portraiture, using the maximum apertures of either f/4 or f/5.6 on the 24-105mm STM, the Sigma 24-105mm is the only one of the three lenses that offers good edge sharpness. At the other end of the focal range, 24mm at the maximum f/4 aperture, things are better for the Canon f/4L version, but here again, the 24-105mm STM is struggling to offer anything approaching homogenous results. That extra stop of transmission on the Sigma lens is going to ensure a brighter viewfinder, as well as help with faster shutter speeds. Those combined with that wider f/4 maximum aperture makes the Sigma lens the best option for low-light shooting. That all comes at the expense of some extra weight, however, with the 885g Sigma lens weighing more than half again as much as the 525g 24-105mm STM. At 24mm and with a wide aperture setting of f/4, the 24-105mm STM lens doesn’t offer the same level of edge sharpness as the more expensive Sigma or Canon f/4 L alternatives. Zoom in to 105mm using the maximum aperture for portraiture, however, and the Sigma 24-105mm f/4 DG OS HSM A lens is the only one of the three with homogenous sharpness. Despite ranking behind the more expensive Sigma and Canon pro L competition, the new 24-105mm STM standard zoom offers respectable results across the board. But if you can afford to shell out an extra $300 for the $899 Sigma 24-105mm f/4, you’ll certainly benefit from better edge sharpness at the wider aperture settings, a faster fixed f/4 aperture when shooting at 105mm, and better light transmission, too. But not only is the Sigma more expensive, though, it’s more than half again the weight of the 24-105mm STM, too, which will be significant for many photographers desiring portability. The new Canon 24-105mm STM is intended instead to fill a gap in the Canon EF-mount range, offering a more affordable and convenient standard zoom option for enthusiasts stepping up to full-frame, and it does that well. If you want the best image quality at these focal lengths, other optics are available — they’re just bigger, heavier and more expensive.